I love my DCI 962s. I used to play a lot, 3x a month on the course and 3x a week on the range and practice. I was consistently in the mid 80s. Over the last 10 yrs I have tapered off, (kids/work etc) and my game has suffered playing 5 round a year with no practice. So, I was recently fitted for ping G400s and will use them to get my game back on track (I started finding the time to practice again). I sent my DCIs off to be refurbished and had them also fitted to my swing. They will lie in waiting until my game is good enough to use them again! They have the perfect combination of workability and forgiveness a 12-15 HCP needs! They are just not the clubs for a weekend warrior. Just picked these up online for around $100. I used to play the DCI Black and found these to be comprable. Tried Callaways, but couldn't get used to the look. I find the DCI's nearly as forgiving and the feedback is entirely better. Good set of irons. Just got these clubs for $99.99 off ebay took em to the range to try them out. These are great clubs and I would recommened them to any one with a good repeatable swing. I used to play the DCI oversize + black until they were stolen from me this past month, i wont say the 962's improved my distance but the consistancy is incredible. I would probably give credit to the reduced offset in these clubs. If your thinking about moving into more of a gamer iron buy these's and give them time and work. Have used these clubs heavily for 10 years and still love them as much as new. Have changed the slightly heavier R400 shafts a few times, as well as the grips and they play the same again. Now considering selling them (2 - PW) for another identical set, only in better condition! Overall, an awesome combination of control, forgivness and feed back. Really sets the bar for 'the better players' cavity backs. I have tried just about every iron on the market, from Srixons, Taylors, Callaways, Mizunos, aand this set is as good any of them for a fraction of the price. Just like all the other reviews say they work like a blade and have forgivness. I love the square toe on these and the set up. I've only played them from the start of this year and got them used however I've found them to be very accurate and can cut or draw them at will. For the money the best irons on the market if you have game to play them. This is my first review ever for any golf product that is how much I think of these irons, I wish I found them 10 years ago. mp 29s, mp 33's, callway x-14's, hogan apex plus, tour preferred, tour preferred cb's, srixon I-302, I-201, 845's. Although not the best ball striker, I hit these clubs flush and have very good feedback on the mis-hits. I have played with a few other clubs Clevlands, Taylor Made. But these ones looks and feel the best when you are looking over the ball. I found my set on Ebay and was extremely happy once I started swinging them again. They offer the control of a blade, with a little forgiveness due to the cavity back. All around a great set of irons for the price. I have owned this set of 962's since I played with them in college. Now, after 17 years, several sets of grips and shafts and thousands of rounds later, they still reward me with great feel and results. I have almost pulled the trigger on a new set of irons over the years, only to ask why? I still play well with my 962's and every test I've done of newer model clubs doesn't result in a better shot than what I get with my trusty 962's. They provide a solid feel, but aren't as forgiving on mis-hits. They aren't as pretty as a newer set of AP2's however my tests resulted in the same shot with a 9,6 and 4 iron from each set. I had my set of 962s custom fit close to 10 years ago when I was a low single digit handicap. I played well with them then and actually hit the ball better today despite now shooting in the low 80s. These clubs have tremendous feel and playability; however, they can be a little unforgiving on mis-hits. 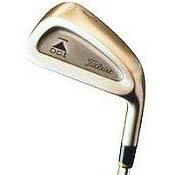 I sometimes think about upgrading to a new set, but just can't justify getting rid of these great irons.